The Root Cause Analysis allows teams to identify and explore in detail the specific root cause of a problem, while providing supporting evidence at each step. This method allows teams to objectively focus on the cause of the problem – eliminating biases, groupthink, and assumptions made along the way. Our Root Cause Analysis model uses the 5 Whys approach. State the specific problem that needs to be addressed. Identify and categorize the possible causes for that problem (the first “why”), and attach any supporting documents. Rate each cause based on the likelihood that it led to the problem. Move forward with the top-rated cause, and identify the possible causes for that problem (the second “why”). Repeat steps 1–4 until the root cause of the problem is identified. Develop an action plan to resolve and mitigate the identified root cause. 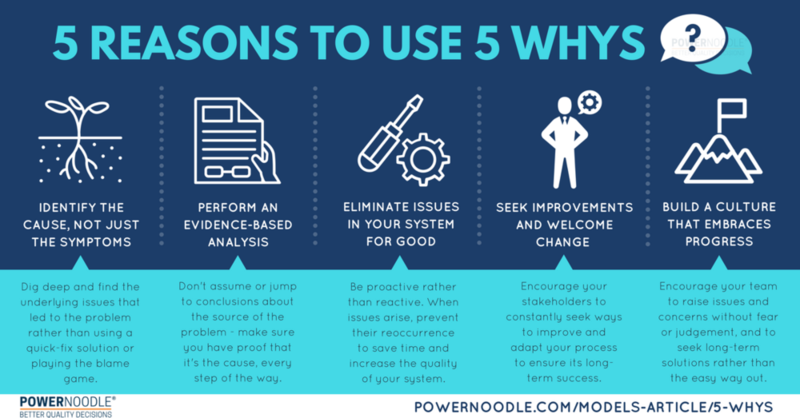 The Root Cause/5-Whys analysis can be used by project managers, Lean Six Sigma managers, quality managers, continuous improvement managers, and process managers. To prevent a problem from reoccurring, you need more than just a quick fix – you must find the cause and address it thoroughly before it has the chance to reoccur. Systematic issues are often mislabeled as being a single person’s fault. Don’t play the “blame game”: with the Root Cause/5 Whys Analysis, your team can objectively examine the content of the actual problem rather than its symptoms, history, or the differing interests of the team members (Brassard & Ritter, 1994). 1) NOODLE & TAG: Identify possible causes for the problem (i.e., ask the first “why”), and tag each by category (e.g., materials, methods, measurement). Add supporting documents and links to each idea. 3) RATE each cause by the likelihood that it led to this problem. 4) MOVE FORWARD with only the top-rated cause, and identify possible reasons for its occurrence (i.e., ask the second “why”). Follow the same process as above for the subsequent “whys” until you’ve reached the root cause of the problem. 5) ACTION PLAN: Develop an action plan to resolve this issue and prevent its reoccurrence. Quality – Perform an unbiased, objective investigation of the root causes of a problem, avoiding blame and quick-fix solutions to systematic issues. Efficiency – Regain valuable stakeholder time by eliminating the problem at its source. Engagement – Build collective knowledge and team consensus around the problem to build support for the final solution (Brassard & Ritter, 1994). Agility – Be proactive; improve your process and eliminate future issues. Brassard, M., & Ritter, D. (1994). The memory jogger II. USA: Goal/QPC. George, M. L., Rowlands, D., Price, M., & Maxey, J. (2005). The lean six sigma pocket toolbook. New York: McGraw-Hill.